First up is a car that has slipped under my radar for a while. I had the opportunity to drive one a few months ago and stupidly missed out. With 471bhp from a roaring, naturally aspirated 5-litre V8 all wrapped up in this wonderfully futuristic exterior, the LC500 is the big and bold luxury GT sportscar no one is talking about, and they really should be, as it’s actually pretty damn cool! Inside, you’re surrounded by plush suede and leather and lots of fancy space-age tech – it’s a really lovely place to sit, but it is also a bit cluttered in places – it took me a while to work my head around the various switches and buttons but eventually I got it in to Sport+ mode where that incredible V8 comes in to its own. As you accelerate the engine makes a loud shouty bellow that is becoming harder to come by these days due to the adoption of turbo-charged engines over these prehistoric icecap melters. It’s a very pleasant surprise from Lexus and I wouldn’t be offended by one as a replacement to a BMW M6, a Jaguar V8 F-Type or even a Mercedes S500, you certainly won’t see another one in the golf club car park. I think the reason I liked it so much on the day is that I just wasn’t expecting it to be any good. I mean the ride isn’t as luxurious as a Lexus should be and you can only really make that V8 bark when everything is turned off, which is completely against the car’s luxury character, but on the day I liked it. I also loved the seats and the great styling. Full disclosure, as much as I love refined sports cars and luxury, handcrafted interiors, I was also born and raised in rural Suffolk, meaning I also love just about anything that belongs in the mud. This includes but is not exclusive to tractors, Labradors, quad bikes, me, and the Arctic Trucks Hilux AT35. Originally designed on the Toyota Hilux to tackle the almost Martian landscape of Iceland, Arctic Trucks have been modifying these already-immortal trucks for a while now and as of 2018, we will be able to order one through Toyota here in the UK. Featuring a 25% increase in ground clearance due to some whopping 35 inch all terrain tyres mounted to 17×10 inch wheels and some raised Fox Shox suspension, the AT35 is a behemoth of a vehicle and even though threading it through the Hill Route at Millbrook Proving Ground was far from athletic, it sure was fun. It just felt silly at first when as you tower over just about every other car on show, including a G350 Mercedes, but that just added to the occasion. As I was driving it all I could think about was plaid shirts, trucker hats and the next family reunion down at the ol’ watering hole. I actually have an Isuzu D-Max AT35 for a week at the end of June, so there’ll be some more Arctic Truck-based content coming very soon! Now I’m probably going to upset some people here when I admit that I am not a huge fan of the Audi R8. Don’t get me wrong, I love how the brand re-wrote the book on supercars and made one that you could actually drive everywhere every day, but I never got the same “fizz” from the R8 that I got in cars like the Ferraris, the McLarens and the Porsches. I don’t know if it’s because when you sit in one it just feels like every other Audi or the fact that it gives average drivers a false sense heroicness because of just how easy it is to drive – either way, it never made my top 5 anything… until now. The limited-edition Audi R8 RWS (Rear Wheel Series) is the R8 I’ve been looking for from day 1. It still has the great aggressive looks and that thunderous 5.2-litre N/A V10 but it’s now without the Quattro four-wheel-drive system and by removing things like the multi-plate clutch centre differential and front driveshafts the car is now 50kgs lighter and it all of a sudden feels like the driver-focused weekend hooligan we all wanted in the first place. Unfortunately, it’s not quite that simple and yes, the car does feel more suited for the “purists” now (although I feel the limited run of 999 appeals more to buyers than the RWD aspect) but the differences are subtle, and it takes a bit to actually feel, but when you give a little tickle and you feel that grip start to slip you can definitely tell you are not in the standard Quattro model. The safety net people have known to rely on in the four-wheel-drive version is no longer there to help if you push the car too far, the stabilisers are well and truly off. With limited production numbers and a whopping £13k less than the Quattro version, it’s definitely the one I’d have. I really wanted this to be number 1 on my list, but I just didn’t get enough time behind the wheel to give it a proper review. Fortunately for the AMG GTR, the brief time I did spend in it on the High-Speed Bowl and given my time behind the wheel of both the AMG GTS and AMG GTC in the past, I have a good enough knowledge of the car to know it belongs in my top 2 and probably in my top 5 of cars for sale today. The AMG GTR is a proper thoroughbred muscle car through and through. It’s got the soul and theatre of a choppy 1970’s American street racer with agility and preciseness of a track-focused GT3 race car. It really is the whole package. Firing up the GTR is like kicking a dragon in the knackers while it’s sleeping, it burst into a ferocious roar and you can literally hear all 585 of those horses snapping into action. It’s so raw and loud and it only gets better as the revs rise. As I said, I only got to drive the GTR on the High-Speed Bowl, but that was enough to A) feel the power as you push pedal to the metal and watch the speed rise at you smash through the 7-speed dual-clutch ‘box and B) appreciate how amazingly engineered the car is as you sit in the top lane of the bowl at speeds well over the tonne whilst still feeling planted to the road. The 4-litre, twin-turbocharged V8 is now in a huge range of cars on offer not only by Mercedes-AMG, but also Aston Martin in their all-new Vantage and also the V8 DB11 and DB11 Volante, but it has been tuned differently to produce 585hp and 516lb-ft of torque. The GTR also benefits from a lot of carbon-fibre. The front wings, roof and torque tube are all carbon along with a load of other parts including that rear wing and rear diffuser. Inside it’s a modern cocktail of Alcantara and yet more carbon fibre and the tight, body-hugging bucket seats hold you in place with cool contrasting yellow seat belts. The car feels enormous as you sit nice and low and peer down what looks like a never-ending bonnet but when you’re driving it, it feels half the size. Everything about this car is in your face, from noise to the AMG Green Hell Magno exterior colour – it’s not for the shy or reserved. This may come as a bit of a surprise, but I’ve been a closet G-wagon fanatic for years. I’ve always loved the old-school jeep look to it and the sheer lunacy of models like the G63, the 4×4 Squared and the truly outrageous G63 6×6. It’s the “two fingers to the man” approach we usually only see with supercars and I love it. It’s an anarchic off-roader that has been causing arguments among avid Defender owners for decades and it’s actually really good off-road! I’ve wanted to drive one for years but was always worried that it would be a huge let-down, but I can confirm that after spending some quality time with the G350 BlueTEC off-road, I can confirm that it is officially #NOTSHIT – in fact, it’s pretty damn good! Mercedes pretty much copied the Porsche to design with the G-Wagon by using the “if it ain’t broke, don’t fix it” mantra (something I wish Land Rover would have followed with the Disco5) and the results definitely show. The styling has been pretty much the same now for over 35 years and even though Mercedes claims that the new 2018 model will only share 20% of its parts with the predecessor, it will still retain those classic looks. A lot like the aesthetics, the off-road tech is simple but very effective. It uses a ladder-frame chassis with good-old-fashioned live axles with proper spring and shock suspension and has 3 locking differentials and it also has a wading depth of 700mm. The turbo diesel V6 pushes the G Wagon up steep inclines with ease with the low-range gearbox and locking diffs mean you’ll struggle to get this thing stuck in even the most hostile of environments. 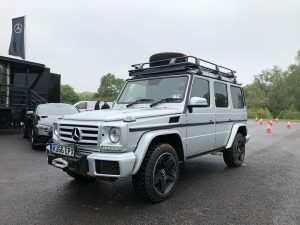 My instructor on the day owns 10 Land Rovers and runs an off-road centre up in Scotland and even he said that if he had the money, he’d have one of these instead and after an hour or climbing steep hills and driving over complicated ruts, I could see why. The G350 performs the same way my old Land Rover Discovery 3 did off-road, but instead of being replaced by fancy electrical ascent controls and buttons, the G is pretty much the same underneath now as it was decades ago. You still have to drive it and pay attention to what you’re doing which just makes the drive that bit more rewarding. The G Wagon has a certain, hard to explain charm and appeal that makes it feel that little bit more special. The engine is no more refined than other V6 diesel units and the interior is plush and comfortable but by no means, Range Rover beating, yet it still wins my heart over the other SUVs it’s up against. In conclusion, I had a great day at my second SMMT Test Day and I can’t thank them enough for inviting me back as it gave me a chance to dive a lot of cars I wouldn’t normally test, and as a result, create eclectic lists like this one.